BaitRageous: A disturbance in the woods! A disturbance in the woods! Yesterday there was a huge disturbance in the ten acre woods. Lots of rustling, scurrying, and barking by the neighbors, the squirrels. What was causing all of this uproar? I'm not sure, but just before I ran into the house to get the camera, silence came over the ten acre woods. You could hear an acorn drop. Hmmm... what's going on? After retrieving my camera, I scanned the trees to see if I might see what was causing the ruckus. 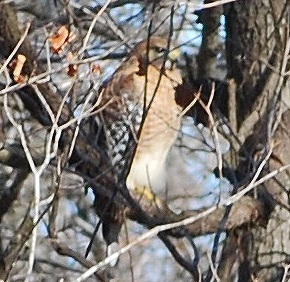 Finally, buried behind a lot of twigs and branches, I discovered a hawk. 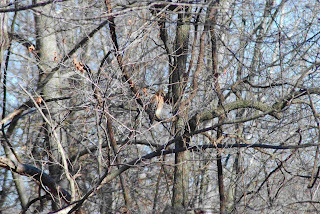 No double about it, this hawk is looking for a meal with the main course being a bushy tail. Looking through the camera it was hard to determine the hawk's species. 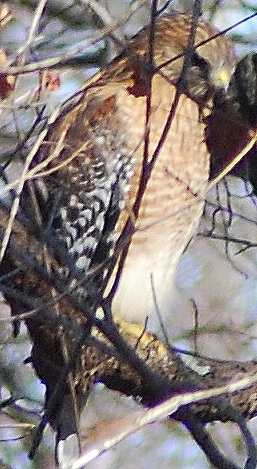 After transferring the photos to my laptop, I was able to identify the hawk. It was a Red Shouldered Hawk, which is common in this area. 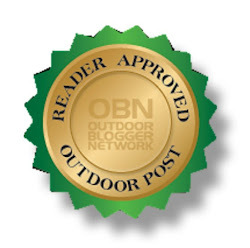 Normally, we have an abundance of squirrels, but on occasion they all disappear, thanks to the Great Horned Owl, Red Tail Hawk and Red Shouldered Hawk. What's in your woods, river, lake or bay? Go find out! 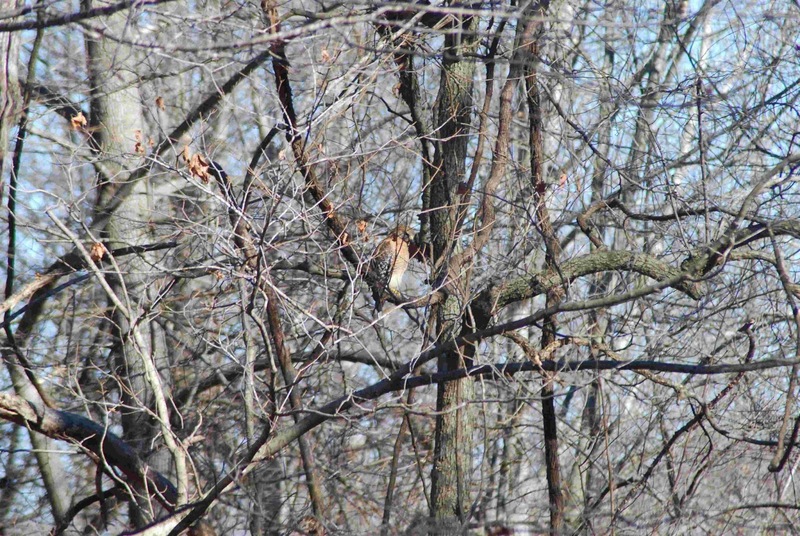 We have a similar bird on our property, but it won't sit still long enough to get a good look at it or shoot a picture. All I ever see is a swooping blur. Near the lake, sort of?